Recently, we demonstrated in a hands-on video the multi-window feature that was just delivered for the Samsung Galaxy Note 2. Then the next turn we all hope that the feature will be rolled out for the smaller brother, the popular Samsung Galaxy S3. 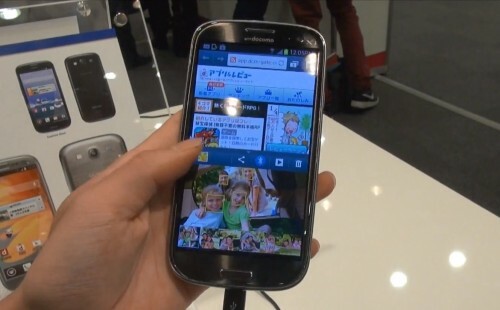 You may go this dream came true: a new Japanese version of the SGS3 has integrated multi-window already. The Japanese provider NTT Docomo will soon launch a local version of the easily bored SGS3 bring the words "Alpha" (SC-03E) on the market, the RAM on a Exynos 4412 quad-core CPU with 1.6 GHz and 2 GB features and LTE modem and from the start with Jelly Bean is delivered. So far, so unaufregend. An interesting detail is noticed in a hands-on video that is currently circulating on the net. So far only in the Samsung Galaxy Note 2 available multi-window function, thanks to the relatively flexible two apps can run simultaneously on the screen, is also integrated into this SGS3. This video is about to see from minute 1:02. The integration of multi-window in the Galaxy S3 Alpha firmware nourishes naturally hope that the feature eintrudelt soon on European SGS3 via OTA update. This hope we want to slow down a bit but as a precaution, because it is quite conceivable that the function can only be used on devices that are equipped with 2 GB of RAM - that would be in Germany as the only LTE-enabled versions of the SGS3. One will have to wait and see what the next OTA updates and / or firmware leaks bring the SGS3 - but it is fairly certain that the feature will be integrated at least in various stock-based custom ROMs in safe Not too long or at least optional can be nachgeflasht. Whether and if so, when that's the case for things, their course with us. Are you interesed with the multi-window feature? Opinions in the comments.